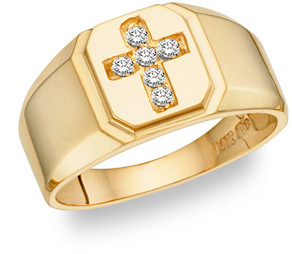 High quality, 14k gold men's diamond cross ring. Set with six beautiful, white round diamonds, H-I Color, SI1-SI2 clarity, 0.06 carats. Ring weighs approx. 8.5 grams. We guarantee our Diamond Cross Ring - 14K Gold to be high quality, authentic jewelry, as described above.